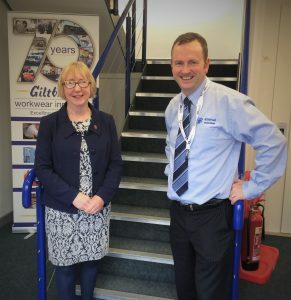 We were pleased to welcome MP for Erewash Maggie Throup to our plant, she kindly took the time out of her busy schedule to pay a visit to our laundry facility. 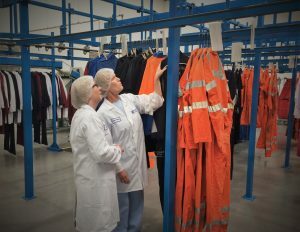 We talked her through the entire workwear process and she was very surprised at the amount of work that goes into the quality service we provide. While here we talked about business in the local area and her plans going forward, this region is known for having expertise in textiles and to be able to carry on and be a part of that tradition is something we are very proud of. All the staff at Giltbrook were pleased she took the time to meet them all. Everyone here at Giltbrook was surprised at her interest and knowledge in our pharmaceutical and Hi-Care garments. Coming from a Biomedical background, she understood the research and effort that goes into achieving the desired product and processes for such companies. Futhermore, she understood the stringent regulations such garments must conform to. The visit was a great experience and we were glad to be able to have some time with our local MP and discuss the issues and challenges we currently face. We would certainly recommend taking time to meet your local representative. Everyone here would like to thank Maggie Throup for coming to see us. If you want to know more about what we do explore our site or get in touch here we’d love to hear from you.